Who was responsible for the mysterious rappings? 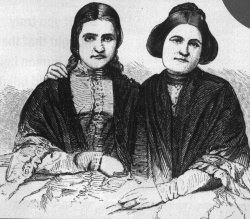 On March 31, 1848, near Rochester, New York (USA), two sisters, Katherine and Margaret Fox, ages 11 and 13, claimed they heard inexplicable rapping sounds emanating from a room in their farmhouse. Soon carriages lined up outside their home as people came to witness the sisters supposedly communicate with the spirit of a murdered itinerant peddler rumored to have been buried in the basement of the house five years earlier. "My sister Katie was the first one to discover that by swishing her fingers she could produce a certain noise with the knuckles and joints, and that the same effect could be made with the toes. Finding we could make raps with our feet - first with one foot and then with both- we practiced until we could do this easily when the room was dark. No one suspected us of any trick because we were such young children...all the neighbors thought there was something, and they wanted to find out what it was. They were convinced some one had been murdered in the house. They asked us about it, and we would rap one for the spirit answer "yes", not three, as we did afterwards. We did not know anything about Spiritualism then. The murder, they concluded, must have been committed in the house. They went over the whole surrounding country, trying to get the names of people who had formerly lived in the house. They found finally a man by the name of Bell, and they said that this poor innocent man had committed a murder in the house, and that these noises came from the spirit of the murdered person. Poor Bell was shunned and looked upon by the whole community as a murderer. As far as spirits were concerned, neither my sister nor I thought about it...I have seen so much miserable deception that I am willing to assist in any way and to positively state that Spiritualism is a fraud of the worst description. I do so before my God, and my idea is to expose it...I trust that this statement, coming solemnly from me, the first and most successful in this deception, will break the force of the rapid growth of Spiritualism and prove that it is all a fraud, a hypocrisy and a delusion." After 40 years, in 1888, the year the first version of the Great Controversy was published, the Fox sisters could no longer bear to conceal the truth any longer. This prophecy was a marked failure. There is no evidence it was ever considered blasphemy to speak against the rapping, and even though the movement increased in popularity for a short period, it eventually died out. The movement was already on the decline prior to the Fox sisters' admission in 1888, and after their deaths in the 1890s it continued to decline. The entire Spiritualist movement fizzled out in the 1920s after popular magician Harry Houdini exposed numerous popular mediums as fakes and frauds. It developed in the mid-19th century and within 20 years had an estimated one million members. The movement's popularity, however, dropped sharply by the end of the century mainly because many mediums were exposed as frauds. The religion experienced a resurgence during World War I when families looked to mediums hoping to reach the souls of dead husbands, fathers, and sons killed in the war. This time, too, fraudulent mediums preyed on people's vulnerabilities. Houdini was at the forefront of exposing this second wave of mediums. Houdini had been guilty of s�ance fraud himself, when his career was at its lowest. He hosted special Sunday night performances for the California Concert Company, a Midwestern medicine show, in 1898. During s�ances, Houdini floated tables and played musical instruments while tied to a chair. After the company disbanded, he and his wife Bess continued to give s�ances for local union halls and dime museums until they signed with the Welsh Brothers Circus, later that same year. Houdini actively exposed mediums by 1923. He attended many s�ances in disguise accompanied by a reporter and police officer to have mediums arrested and their stories published in local newpapers. He also hired psychic researchers to investigate mediums. He sent them to cities ahead of his show to find frauds and report on their activities. When the Houdini tour came to town, he used the information in his performance. He often challenged local mediums to prove their powers on stage. So popular was Houdini as a medium buster that he was asked to join a psychic committee by the science magazine, Scientific American, in 1922. The magazine offered a cash prize of $2,500 to any medium able to produce a true physical manifestation before its committee. Several mediums came forward, but the most memorable was Margery. Known as "the Boston medium," Margery's s�ance room was filled with flashes of light, sounds of bugle calls, rattling chains, and trance speaking. The first Scientific American subcommittee that tested her favored her ability. When Houdini sat with Margery, though, he found that she was no different than any other medium he had seen�she was a fraud. Houdini told committee members that he caught Margery levitating a table with her head and ringing a bell with her foot. After much heated debate, committee members voted four to one against awarding Margery the prize. Just before the final report in Scientific American, Houdini challenged Margery to show her supernatural ability on stage in her home town at Boston's Symphony Hall. He offered her $10,000 ($5,000 to her and $5,000 to the charity of her choice) if she could produce a manifestation he could not duplicate. Margery refused to perform under such conditions. Instead, Houdini recreated her s�ance for the Symphony Hall audience. The expos� was so popular with fans, that Houdini made the how-tos of slate writing, rappings, spirit hands, and bell-ringing a permanent part of his show after 1925. He also extended his challenge, offering $10,000 to any medium who could produce true spiritual phenomena. At the same time that Houdini was waging war against Margery, he was demonstrating medium techniques at universities, police academies, churches, banquets, and conventions. He published many articles and several books including Houdini Exposes the Tricks Used by Boston Medium "Margery" and A Magician Among the Spirits, both released in 1924. Houdini considered the latter book one of his great accomplishments. It exposed the methods of many famous mediums including the Fox Sisters, Davenport Brothers, Dr. Henry Slade, Eusapia Palladino, and Anna Eva Fay. Your Questions Answered: What about the rise of the New Age and Occult? After the Spiritualist movement fizzled out, some believers in Ellen White probably wondered what to do with all of the quotes about Spiritualism. Although they no longer seemed relevant, they were soon re-interpreted by many to apply to the occult in general, or to the "New Age" movement. Ellen White never used the word "occult" in her writings, but in 1979 the publishers of the Ellen White devotional This Day with God placed a series of her quotes on Spiritualism under the title "Beware the Occult" (chapter 239). But such a post-humus re-interpretation of the meaning of the word Spiritualism is questionable. Ellen White spoke of spiritualism in two ways. First, she spoke of the organized religion of Spiritualism. Secondly, she often used the word "spiritualism" when discussing contact with the dead. Recently, popular television personalities, such as John Edward in the United States, have popularized the idea of contact with the dead. While some see these events as a revival of Spiritualism, there is little evidence of a massive revival in the Spiritualistic churches. In fact, statistics gathered between 1991 and 2001 show the SDA Church to have added far more members than Spiritualist groups. Contact with the dead could certainly be viewed as an occult practice. However, the Spiritualist Religion has always considered itself a "Christian" religion, and does not enjoin the practices of witchcraft and Satanism. There is no doubt that when Mrs. White condemned spiritualism, she was condemning communication with the dead in particular, and not the occult in general. She did denounce the occult under the terms of "heathenism," "witchcraft," and "sorcery," but she reserved the use of the term "spiritualism" to refer to contact with the dead. Therefore, it is inaccurate to apply Mrs. White's statements about spiritualism to the occult in general. Now let us discuss the New Age. The foundation of the New Age is the pagan religions of Hinduism, Buddhism, and Taoism. The New Age became popular in the Western nations during the 1960s, thanks in large part to a rock music group named The Beatles who adopted and promoted aspects of these religions. Essentially, according to New Age, you are a god and everyone has supernatural powers in themselves that can be developed. The New Age adopted one aspect of spiritualism: belief in contact with the spirits of the dead and contact with angelic spirits. 1. The first tenet of the Spiritualists National Union is the "fatherhood of God." This is in sharp contrast to the New Age which does not believe in a personal God. The New Age god instead is typically a variation on the Hindu concept of Brahma, an impersonal oneness beyond all distinctions, including personal and moral distinctions. Because Brahma is the impersonal force of existence itself, the entire universe is seen as being part of the indivisible Brahma. This belief, that God is all and all is God, is called pantheism. 2. The sixth tenet of Spiritualism is compensation and retribution hereafter for all the good and evil deeds done while here on earth, somewhat akin to the Christian's belief in heaven and hell. The New Age has no such concept of punishment or reward in the afterlife. While more differences could be cited, it will suffice to say that there are significant differences. If we were to use Mrs. White's terminology, the most accurate terms we could use to describe the New Age would be the words "pagan" and "pantheistic." Mrs. White frequently used these terms in references to religions similar to the New Age. Therefore, while the New Age has incorporated communication with the dead into its practices, it would be a mistake to identify this religion as "spiritualism." Instead, it would be more accurate to describe the New Age movement as a pagan or pantheistic religion. 1. Ellen White, Great Controversy, p. 553. 3. People Magazine, Oct. 25, 1999, p. 125. 4. Ellen White, Early Writings, p. 59. 6. This section was taken verbatim directly from The Houdini Historical Center, a virtual museum exhibit presented by Kimberly Louagie, Curator for The Outagamie County Historical Society, Appleton, Wisconsin, USA. To visit the virtual museum and view the entire virtual tour, click here. 7. Ellen White, Spirit of Prophecy, vol. 4, p. 405. 8. Christians in general reject Spiritualism based in part upon Lev. 19:31, 20:6; Deut. 18:11,12; 1 Sam. 28; Isa. 8:19; Luke 16:27-31.